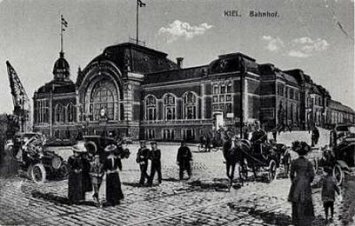 The station was playing an important role during the clashes: troops supposed to quell the uprising, arrived here and had to turn back and showed solidarity, some fights during the next days took place also near the station, and many soldiers already left Kiel being aware that the war was over, but also in an effort to spread the revolution further, and thus to stabilize the situation in Kiel. 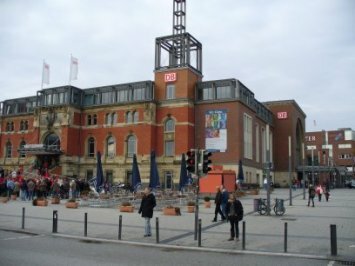 Since a few days no trains went, many sailors walked to Neumünster and took a train from there. 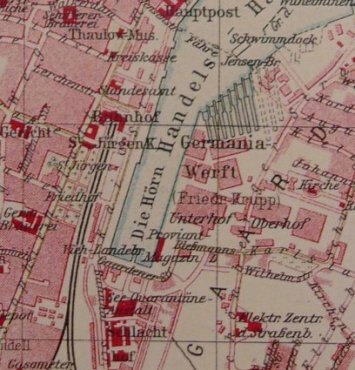 Extract from a 1910 map (town archive). Monday, 4 Nov. 1918: Workers walk around with soldiers’ guns. Everybody to the station. Navy blocks the station. However, some trains still arrive. Marine officers are disarmed and led by strong sentries to the Hansa-Hotel and the "Europäischer Hof" under abusive shouts of the crowd. At 3 pm about 200 men infantry from Neumünster with mashine guns arrived at the station, they manned the entrances at around 6". I get the Volks-Zeitung (newspaper) at the counter with the help of a petty officer. At 9 "the sailors were the masters of the station. They only allowed in travelers in plain clothes in civil, but many sailors. The soldiers from Neumünster had in any case withdrawn. Later suddenly, after loud cheers, soldiers of the Infantery Regiment. No. 84 come out of the station individually without weapons and make common cause with the sailors. They hand over their guns, ammunition and machine guns to the Navy. Great fraternisation and cheers for the infantry. Field-gray helmets were thrown away, caps put on and fuss made. Sailors went about with field-gray helmets and deck officer's swords. Later, at about 11" to the station. Huge crowd at the north portal and enthusiasm. Hundreds of infantrymen between thousands of workers, sailors, civilians and - girls and boys, the infantrymen slowly disappeared in the station and have been transported off without arms. A car took a machine gun including shooters and ammunition. Wild confused ordering and hullabayoo. All of the sailors by and by are armed. At 1" back home, because it was cold. Hardly the bed stands a murderer ROYAL shooting. I get out. At the station deserted. Just in bed a gruelling shooting starts. I out. At the station deserted. People shoot (allegedly out of the Hansa-Hotel and namely by officers) at the soldiers. The hotel is considerably shot, as well as several houses in the street Sophienblatt, like clockmaker Blunck and corner Lerchensteet opposite also. When it quiet, I go through the tunnel along the southern side of the station. A lorry comes Ringstr. and gets under strong fire from all sides. Unfortunately sailors are the occupants. When the shooting has stopped, they find a Petty Officer Second Class with a shot in the leg and a sailor with a shot in the chest. An ambulance picks them up. Sad sight. I had to kneel behind a gas lantern candelabra. The bullets were flying. A petty officer next to me shoots standing freehand one bullet after another into the hotel and after the automobile. Then, long meetings and group formation. Setting up of a machine gun near the accident annunciator and portal-building of farmers. Wait corner Voss for Hussars from Wandsbek, but at about ½ hour (?) they still had not come. With ice-cold legs home. The bitterness against shooting officers is huge.